Tina Gramlin, daughter of Joseph McAfee Gramling and Lula Mae Keever. Mary Gramlin, daughter of Joseph McAfee Gramling and Lula Mae Keever. There are two stones for infant daughters, but neither has a name, so I put them both on this one page. 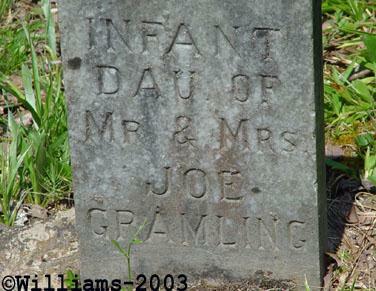 Joseph & Lula had two infant daughters that died shortly after birth. 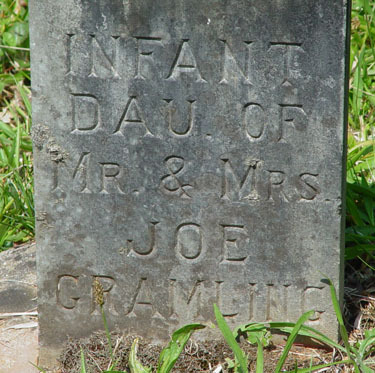 They are buried at Old Macedonia Cemetery and their grave stones are side by side and the only information listed is "Infant Daughter of Mr. & Mrs Joe Gramling" These graves are believed to be that of Tina & Mary. Thru word of mouth we know from Lula & Joe's daughter Della, as told to her daughter Ruth that "there were two babies born that died and both were buried at Old Macedonia Cemetery." One of the babies was called Tiny because she was so tiny (this might have been the one born in 1911). Ruth also said that nothing was ever mentioned about any more babies being buried anywhere else. The names Tina & Mary and the birth & death dates came from others Family Tree Information off of Ancestry.com.